Calling all crafty chicks (and dudes)! Yeah...you! I know you would rather hot glue something than work out, so would I, but we need to get healthy for ourselves and our families. 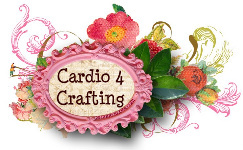 I have a proposal for you: For every 20 minutes of cardio, you get an hour of crafting. I think that sounds fair. And hey...if you are REALLY talented, maybe you can craft while you do cardio...just nothing with knitting needles, ok? While we're at it, let's just make this a little support group. Every Friday we can share our progress. I'll go first.